NOTE: Before or after purchase, please watch our newly released detailed video tutorial on YouTube (httpswww.youtube.com/channel/UCirGFCTsdKbjqcPQgX-bEPw ). The maximum length of the band is 8 inch, please do NOT buy if you have a large wrist. and with the app to analyze your fitness and sleep activities to help you improve your lifestyle; feed and sync data to Apple Health. users can link & sync to Apple HealthKit! NOTE: This is a sport and recreational device, NOT a medical device. If you have a heart problem, please ask your doctor to get a professional HR monitor. iPad, iPod touch etc. 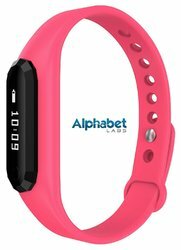 NOTE: This smart band is featured by "Low-Energy Bluetooth Technology" which means you can NOT directly connect it from your phone's bluetooth, but you can link and pair it inside your app.